Reference number for this case: 16-Oct-54-Livry-sur-Seine. Thank you for including this reference number in any correspondence with me regarding this case. Paris. -- The flying saucers continue their infernal round, but it seems that the French are not alone any more about "celestial visions". The majority of the news relating to the mysterious machines came indeed from Italy during the weekend. They walked in the wood of Uzelles, Saturday afternoon, when they saw a strange being laying across a path. In spite of their fright, they took the time to look at him close enough to give a description. He had the size of a man, but his body was covered with abundant hairs of chestnut color. He had a round and hairy head, but no ears and excessively sharp eyes. "He made a gesture to us with his arm twice, they added, but as we were not reassured, we did not dare to pass in front of him and we made a detour of almost two kilometers to avoid him." Two children who were with the farm woman also gave a very precise testimony and description. Alerted, the farmers armed themselves with their shotguns and made a search, but in vain. In the Ille-et-Vilaine, in Paramé, a plaster workman stated to have seen, Saturday evening, around 07:45 p.m., two luminous discs which went up in the sky at an extraordinary speed. A third luminous disc seemed to follow a parallel line in the horizon, with a pace much slower than the two others. The discs, while moving away, left behind a tail similar to that of a comet. Lastly, the personnel of the airfield of Issoire-le-Broc and the chief controler Hébaut, who was in flight, observed a shining machine of circular shape hovering during nearly two hours at very high altitude, before moving slowly towards the west. Close to Varèse, several motorists saw a disc of blue color, clearly detached on the background of the starry sky. After having stopped during a few minutes, it took again its vertiginous race towards the north, disappearing with a "typical" whirring sound. during the night, the strange luminous object appeared a second time in same celestial space. From Turin, it is reported that several workmen of an establishment of the industrial park of Mirafiori saw a "luminous object" having the shape of a cigar, on the background of the sky. The "cigar" remained motionless in the sky during one hour, during which, according to the witnesses, it would have changed from time to time of shape and luminosity. The craft then disappeared by moving vertiginously towards France. From Messina, finally, one learns that many people living on two banks of the strait separating the peninsula from Sicily saw a "luminous circle" motionless in the sky, at 2.000 meters. The machine, which was observed for ten minutes, came down quickly towards the sea to take again altitude three times. After these maneuvers, the "luminous circle" disappeared at a strong pace in the direction of Mount Etna, leaving a luminous trail behind. All these appearances were the tpoic od a statement to the press by professor Antonio Eula, holder of the chair of aerodynamics at the University of Rome. This eminent scientist in particular affirmed: "We do not know entirely the mysteries of our solar system, but we know as of now that beings similar to us cannot exist on the currently known planets. If there are some, they can only be very different. Therefore it is absurd to speak of Martians capable of human activities." And the professor concluded that one could not, in an absolute manner, conclude that they are "experimental craft intended for a military use and protected by an impenetrable secrecy". Two farm women and two children were out walking in the Usselles when they saw a strange being of human size but covered with plentiful brown hair lying on a path. It had a round hairy head, extremely piercing eyes but no ears. It gestured with its arms to the witnesses, as if asking them to approach but they preferred to go round the longer way to avoid it. Later inhabitants armed with guns organised a search but nothing could be found of the being. Alain Gamard, citing Info OVNI 10, citing La Montage-Aurilla 18 October 1954. Though there is a claim the woman were close enough to make the given description, it is also said they made a detour of 2 kilometers to avoid the hairy man. This does suggest that they did not really dare to get that close of him. As for the absence of ears, I would suspect that the man was a so hairy vagrant that his ears were simply not visible. 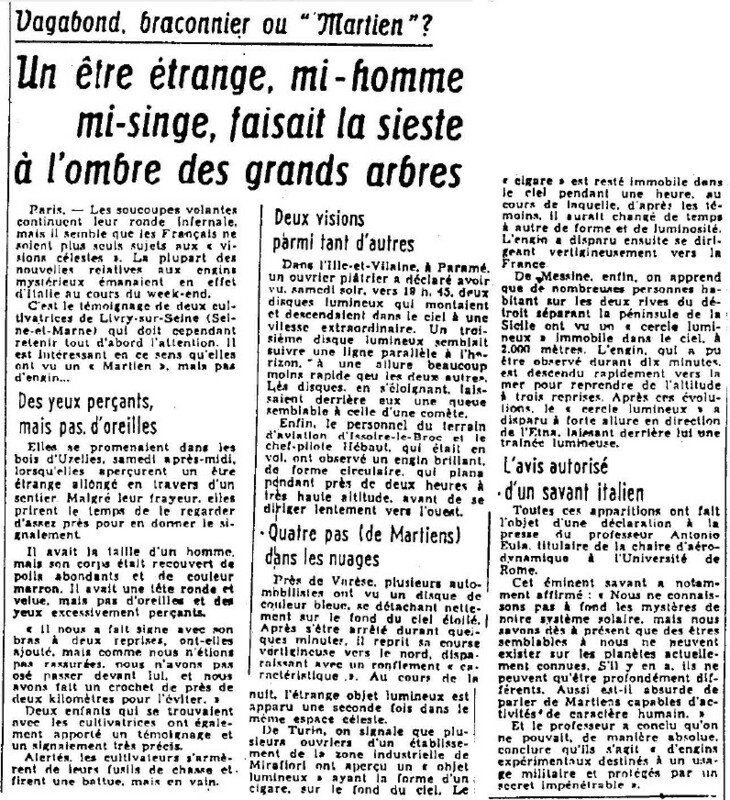 [---] Article in the regional newspaper La Montagne, Aurillac issue, France, October 18, 1954. [---] Ufology bulletin Info OVNI, #10, France. 1.0 Patrick Gross May 30, 2010 First published. [le1]. 1.2 Patrick Gross August 13, 2013 Addition [pr1]. 1.3 Patrick Gross March 2, 2017 Addition [ub1].